Centro de Regulación Celular y Patología "Joaquín V. Luco" (CRCP), MIFAB, Facultad de Ciencias Biológicas, Pontificia Universidad Católica de Chile, Santiago, Chile. Prion diseases are fatal neurodegenerative disorders associated with the conversion of the cellular prion protein (PrPC) into a pathologic isoform. Although the physiological function of PrPC remains unknown, evidence relates PrPC to copper metabolism and oxidative stress as suggested by its copper-binding properties in the N-terminal octapeptide repeat region. This region also reduces copper ions in vitro, and this reduction ability is associated with the neuroprotection exerted by the octarepeat region against copper in vivo. In addition, the promoter region of the PrPC gene contains putative metal response elements suggesting it may be regulated by heavy metals. Here we address some of the evidence that support a physiological link between PrPC and copper. Also, in vivo experiments suggesting the physiological relevance of PrPC interaction with heparan sulfate proteoglycans are discussed. Prion diseases, also called transmissible spongiform encephalopathies, are fatal transmissible neurodegenerative disorders that include Kuru, Creutzfeldt-Jakob disease, fatal familial insomnia and Gerstmann-Sträussler-Sheinker syndrome in humans, scrapie in sheep and bovine spongiform encephalopathy in cattle (Prusiner, 1998). These diseases are caused by the conformational transition of the native and predominantly a-helical cellular prion protein (PrPc) into a significantly more, β-sheet containing pathogenic isoform (PrPsc) (Pan et al., 1993) that unlike PrPc is insoluble in mild detergents and partially resistant to digestion with proteinase K (Caughey and Raymond, 1991). Sporadic and familial prion diseases are initiated by spontaneous formation of the scrapie isoform from wild-type or mutant PrPc, while in prion diseases of infectious origin the conformational transition is caused by inoculation of the scrapie isoform, which acts as a template for converting PrPc into PrPsc, thus, in that form it may propagate itself as an infectious agent. PrPc expression is required for prion disease, since genetically modified mice that lack expression of PrPc are resistant to infection with a mouse prion inoculum (Bueler et al., 1993). PrPc is an N-linked glycoprotein attached to the cell surface by a glycosylphophatidylinositol (GPI)-anchor mainly expressed in neurons (Stahl et al., 1987). The physiological function of PrPc is still unknown, but several lines of evidence suggest its role in copper metabolism as the PrPc N-terminal domain contains a series of histidine- and glycine-containing peptide repeats that bind copper ions with low micromolar affinity. This copper-binding domain is located between residues 60-91 and consists of four identical repeats of the peptide sequence Pro-His-Gly-Gly-Gly-Trp-Gly-Gln (Hornshaw et al., 1995; Stockel et al., 1998; Viles et al., 1999), which is among the best-conserved regions of PrPc in mammals (Wadsworth et al., 1999), suggesting it is important for PrPc function. The octarepeat region is highly selective for Cu2+, and the binding of the metal is pH-dependent (Stockel et al., 1998). More recently, a new copper-binding site outside the octarepeat region was described (Jones et al., 2004). Copper binding to this site has been suggested to have nanomolar affinity and requires His96 and His111 as Cu+2 ligands. One of the effects of copper binding is that it reversibly stimulates endocytosis of PrPc from the cell surface, suggesting PrPc acts as a receptor for cellular uptake or efflux of copper (Pauly and Harris, 1998). However, this hypothesis disagrees with a more recent study showing that although PrPc expression increases copper binding to the cell surface, it does not result in an increased intracellular copper concentration (Rachidi et al., 2003). It also has been suggested that PrPc may be an important copper-binding protein in the brain since cerebellar cells from PrPc-knockout mice (PrP0/0) contain only 20% of the copper present in cells from wild-type animals (Brown et al., 1997a). In addition, we determined that the octarepeat region of PrPC reduces Cu+2 to Cu+1 in vitro (Opazo et al., 2003; Ruiz et al., 2000), supporting a functional link between PrPc and copper. Cu+2 incubation with a peptide corresponding to the octarepeat region of the human PrPc (PrP59-91) resulted in the reduction of Cu+2 to Cu+1 as indicated by the formation of a peak with maximal absorbance at 480 nm in the presence of bathocuproine disulfonic acid. This reduction depends on the tryptophan residues present in the octapeptide repeats, since a mutant peptide lacking the tryptophan residues showed a dramatic decrease in Cu+2 reduction with respect to the wild-type peptide (Ruiz et al., 2000). This suggests that PrPc may normally act as a copper reductase. 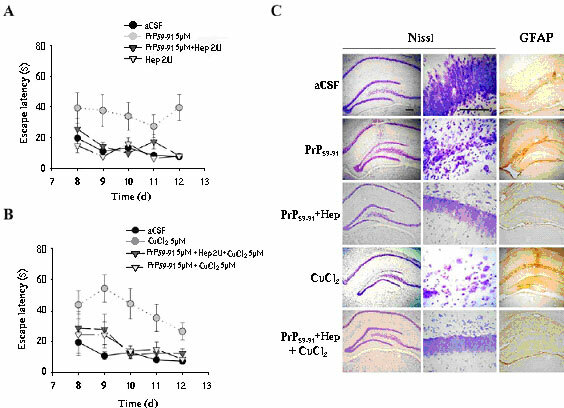 We also observed that the octarepeat region of PrPc protects against copper neurotoxicity in vivo, reducing neuronal cell loss and astrogliosis induced by intrahippocampal copper injection (Chacón et al., 2003). Moreover, co-injection with the peptide (PrP59-91) prevented behavioral impairments induced by copper injection, preventing spatial memory loss that was evaluated in the Morris Water Maze. The neuroprotective effect of (PrP59-91) is mediated by the tryptophan residues, as co-injection with a mutant peptide lacking the tryptophan residues (PrPTrp Ala) did not prevent the spatial memory loss induced by copper injection. In contrast, co-injection with a mutant peptide lacking the copper-binding residues (PrPHis Ala) did prevent spatial memory impairments induced by copper (Chacón et al., 2003). These results suggest that copper reduction is the main event in the neuroprotective effects of (PrP59-91) (Inestrosa et al., 2005). Interestingly, the injection of (PrP59-91) alone induced impairment in the spatial memory acquisition (Fig. 1A). This neurotoxic effect of (PrP59-91) may be a consequence of competing with endogenous PrPc for the normal binding of membrane proteins and extracellular matrix components. It is known that the 37-kDa/67-kDa laminin receptor (LRP/LR) interacts with PrPc and acts as a receptor for cell surface PrPc (Gauczynski et al., 2001). Heparan sulfate proteoglycans (HSPGs) have been identified as a co-receptor of LRP/LR in this interaction via heparan sulfate (HS)-binding domains on both proteins (Hundt et al., 2001). The HSPG-dependent LRP/LR-binding site on PrPc is localized between residues 53-93, co-localizing with the octarepeat region. Thus, it is possible that (PrP59-91) induces toxicity by competing with PrPC for the binding to HSPGs and LRP/LR interfering with the normal cellular function. In order to assess this hypothesis, rats were estereotaxically injected, into the dorsal hippocampus, with the peptide (PrP59-91) in the presence or absence of heparin. Four days after injection, animals were trained in the Morris Water Maze (MWM) paradigm during 10 days to evaluate the spatial memory acquisition (Chacón et al., 2004b). Briefly, MWM consists of a pool filled with water containing a hidden circular platform through which the rats must escape guided by external cues. The time spent by the rat to find the hidden platform is termed `escape latency', which was graphed versus the last five training days (Fig. 1A). Injection of 5 μM (PrP59-91) induced high levels of escape latency compared to cerebrospinal fluid (aCSF) injection even after several days of training (Fig. 1A). Co-injection of 5 μmM (PrP59-91) plus 2 U heparin decreased escape latency values indicating protection against spatial memory impairment. This suggests that (PrP59-91) may induce neurotoxicity through interaction with HSPGs present in the extracellular milieu. As observed in figure 1C, the behavioral impairment observed was related to morphological changes at the injection site. (PrP59-91) injection induced neuronal cell loss and astroglial reactivity that were inhibited by co-injection with heparin, which was very similar to the results found for aCSF-injected brains. Figure 1. Heparin inhibits PrP59-91 toxicity in vivo. (A) Escape latency versus the last five days of training of rats estereotaxically injected into the dorsal hippocampus with a peptide corresponding to the octarepeat region of the human PrPC (PrP59-91) in the presence or absence of 2 U heparin (Hep). Injection of artificial cerebrospinal fluid (aCSF) as the vehicle and Hep alone are also shown. (B) Escape latency versus the last five days of training of rats injected with 5 μM CuCl2 in the presence or absence of 5 μM (PrP59-91) and 2 U Hep. (C) Morphological analysis of coronal brain sections from injected rats after the training. Nissl stain was performed to reveal neuronal cell loss in the injection site and immunostaining for the Glial Fibrillar Acidic Protein (GFAP) to detect reactive astrocytes. Left panel of Nissl stain micrographs and GFAP immunostaining are shown at 4x magnification (scale bars: 100 μm). Right panel of Nissl stain micrographs corresponds to a 40x magnification showing an area of the upper leaf of the dentate gyrus (scale bar: 30 μm). Heparin- and copper-binding activity of PrPC are localized in the same region of the molecule; moreover, (PrP53-93) binding to heparin is enhanced by Cu+2 (Warner et al., 2002). In order to examine the effect of heparin on PrPC neuroprotection against copper injection, rats were injected with Cu+2 or co-injected with (PrP59-91) plus heparin and Cu+2 (Fig. 1B). (PrP59-91) plus heparin prevents memory impairments induced by copper, suggesting that heparin does not affect copper chelation or reduction by (PrP59-91). At the same time, copper did not affect the protection induced by heparin against the toxicity of (PrP59-91). This effect also was observed at the morphological level. Co-injection of (PrP59-91) plus heparin and copper prevented neuronal cell loss and astrogliosis induced by copper injection, and rats showed Nissl staining and glial fibrillar acidic protein (GFAP) immunostaining similar to aCSF-injected rats (Fig. 1C). In addition to its role in copper metabolism, several lines of research have suggested that PrPc may have a role in antioxidant response relating PrPc expression levels with resistance to oxidative stress and copper toxicity (Brown et al., 1997b). Moreover, PrP0/0 mice show an increased oxidation of lipids and proteins in addition to decreased superoxide dismutase and catalase activities (Klamt et al., 2001). Considering that gene expression of proteins associated with copper metabolism and oxidative stress is stimulated by heavy metals (Durnam and Palmiter, 1981; Murata et al., 1999; Yoo et al., 1999), it would be of interest to determine whether PrPc gene expression is regulated by copper. To examine this possibility, we analyzed the rat PrPc gene (Prnp) promoter sequence for potential metal responsive elements (MRE), which are present in multiple copies in the promoter region of metallothionein (MT) genes that are among the best-studied, heavy metal-inducible genes (Carter et al., 1984; Culotta and Hamer, 1989; Karin et al., 1984). The MRE constitutes an imperfectly conserved 12-base pair sequence motif, consisting of a highly conserved 7-base pair functional core motif (5'-TGC(A/G)CNC) flanked by a less conserved 5- base pair GC-rich domain (Giedroc et al., 2001). Sequence analysis of the upstream region of the rat Prnp revealed an inverted MRE located at position -2070 (GGGCTGTGTGCA) and two MRE-like sequences (MLS) that mismatch the consensus core motif in one nucleotide (-2653 TGCGtCCCCTGC; -2599 TGCGgTCACCCT) (Fig. 2). Sequence analysis of Prnp promoter sequence in other species revealed the presence of one inverted MRE at position -518 in bovine Prnp promoter, an inverted MRE located at position -955 in the mouse Prnp promoter and two inverted MRE sequences at positions -2537, -1083 and a direct MRE at position -90 in human Prnp promoter. It has been reported that copper induces the rat Cu/Zn SOD1 gene, and this induction requires a single inverted MRE sequence present in the 5'-flanking sequence of the SOD1 gene (Yoo et al., 1999). Therefore, it is possible to suggest that copper, and probably other heavy metals, may exert an effect on Prnp expression through the putative MREs present in the promoter regions. Our efforts have been concentrated on this hypothesis, and we recently have observed that copper treatment induces the expression of PrPc in primary hippocampal neurons and PC12 cells. In addition, copper induces the activity of a reporter vector driven by the rat Prnp promoter stably transfected into PC12 cells (Varela-Nallar et al., unpublished observations). The ability of Prnp promoter to respond to copper is consistent with a PrPc role in copper metabolism. In conclusion, as briefly reviewed here, there is much evidence to support a physiological link between PrPc and copper, but although a great effort has been devoted during the last years to understand the physiological function of PrPc, the specific role of this protein in copper metabolism remains elusive. Figure 2. Schematic representation of MRE and MRE-like sequences in the rat Prnp promoter. The MRE and MRE-like sequences (MLSs) in the rat Prnp promoter region (GenBank accession N° D50092) are indicated in white and black bars respectively. The highly conserved 7- base pair functional core motifs are indicated in bold letters and the flanking less-conserved 5- base pair GC-rich domains are indicated in italic letters. Lower case letters indicate mismatches from the consensus MRE sequence. The arrow indicates the transcriptional start site. This work was supported by grants from the International Copper Association (ICA) New York, NY; the Center for Research on Metals and Metalurgy (CIMM)-Chile; FONDAP-Biomedicine Nº 13980001; and the Millennium Institute for Fundamental and Applied Biology (MIFAB) Nº 2398969. L Varela-Nallar and MA Chacon are predoctoral fellows from CONICYT. Received: March 30, 2005. Accepted: April 11, 2005.